Trout Unlimited is a grassroots organization. That means that our success depends upon the active participation of individuals like you. Our members are our organization. A citizens group has been established to provide direct input to the Environmental Protection Agency with regard to the Bonita Peak Mining District Superfund site. 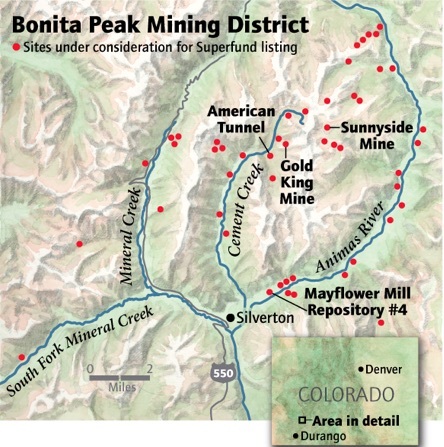 The Superfund consists of nearly 50 mine-related sites around Silverton that contribute to the degradation of water quality in the Animas River watershed. To stay informed, sign up for emails from the Bonita Peak Mining District Advisory Group. You’ll receive meeting notices, updates and documents, as well as notification of opportunities to participate at all levels of the process. As an organization, at both the national and local level, we’re working with the EPA, BLM, USFS and state mine remediation agencies to clean up certain types of abandoned mines where the current laws allow. We are also working to establish new laws to prevent perpetually discharging mines from being permitted in the first place. When the post-Civil War mining industry declined in in the first half of the 20th century, they left roughly 500,000 abandoned hardrock mine sites in the American West where there is no responsible party to be held liable for the pollution or to take on the cleanup. A hundred years later and many of these mines continue to discharge heavy metals into nearby streams to this day. Some well-qualified conservation organizations, watershed groups and state mine remediation agencies want to tackle the perpetual pollution from these abandoned mines. However, they are dissuaded from doing so by the risk of being saddled with permanent liability for pollution they didn’t create. Essentially, if “Good Samaritans” attempt to treat mine water at sites where there is no responsible party, the Good Samaritan assumes that liability forever. Good Samaritan legislation hopes to relax the water quality standards that a cleanup is required to meet, as a 100% reduction of metals is often not feasible. The potential Good Samaritan law would allow very well-qualified entities to utilize passive treatment systems to make improvements to water quality at abandoned mines without being held permanently liable for a problem they didn’t create. Additionally, Good Sam would authorize partial cleanups where less than 100% of the pollutants would be removed without the fear of being fined by EPA for not meeting water quality standards. Trout Unlimited strongly believes that any improvement is worth pursuing and that some reduction of metals is better than none at all. To learn more, click here.